Erik Chevalier developed a logo and offered a prototype for a game he said he would publish -- but never delivered. After settling a lawsuit from the Federal Trade Commission, an entrepreneur must pay a $112,000 fine for allegedly deceiving Kickstarter investors. The FTC filed its first-ever complaint about crowdfunding in federal court Wednesday against game publisher Erik Chevalier after he canceled his Kickstarter campaign and failed to make good on promises to return backers' money. In court documents, the FTC paints the picture of a man who intended to scam his investors and spent the money he raised on personal expenses like moving to Oregon and paying his rent. But Chevalier insists he wanted $35,000 to develop a board game that was created two prominent game designers. The FTC will use a portion of that fine to repay Chevalier's investors. But because he proved to the agency that he doesn't have the money, the fine has been suspended. 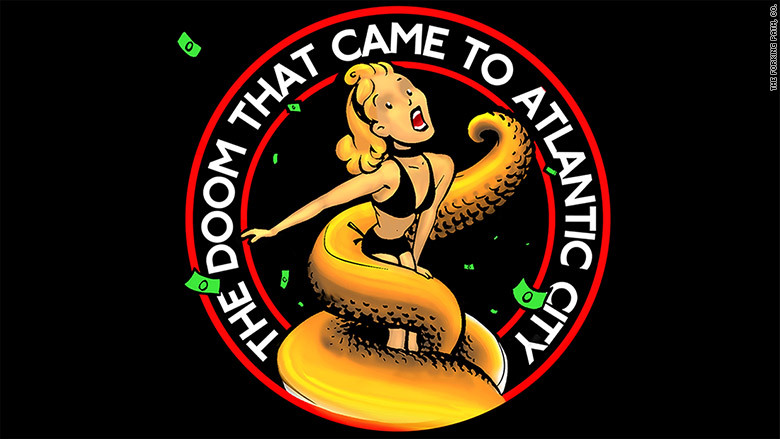 A prototype of the game -- called "The Doom That Came to Atlantic City!" -- includes a Monopoly-like game board that puts players on a quest to wipe out that city's real estate. Using the name The Forking Path, Co., Chevalier launched his Kickstarter campaign in May 2012 and raised $122,000 -- more than triple his goal -- in 30 days. About 1,200 people donated. He set a release date in November 2012, but by July 2013, there was still no game. Chevalier updated donors along the way, citing patent infringement and manufacturing issues, according to court documents. When he canceled the project promised to refund his donors, said he "never set out to con anyone," and cited his inexperience in game development. "Every possible mistake was made, some due to my inexperience in board game publishing, others due to ego conflicts, legal issues and technical complications," Chevalier's post reads. "My hope now is to eventually refund everyone fully," including people who pre-ordered the game on Chevalier's website. But no one has been repaid. The FTC press release said Chevalier's case brings up important consumer protection issues in the age of crowdfunding. Sites like Kickstarter offer an easy way for startups to raise money, but do little to ensure that money goes where fundraisers say it will. Kickstarter doesn't charge donors until a project reaches its fundraising goal, but says the site does not offer refunds and "cannot guarantee creators' work." "Kickstarter has empowered millions of people to be part of the development and production of new creative works. Kickstarter creators have an incredible track record when it comes to following through on their promises," Kickstarter said in a statement. A company spokesman said there are no specific metrics about that track record. Kickstarter is the second most successful crowdfunding site in terms of total dollars donated behind GoFundMe.com, which has a similar policy. It states that "with hundreds of thousands of campaigns, it's not feasible for GoFundMe to investigate the claims stated by each Campaign Organizer," and that donors should be cautious. The advice "only donate to people you know and trust" appears on each campaign page. FTC spokesman Jay Mayfield said the commission does not have data on how common fraud and is in crowdfunding, but it is a matter of concern for the agency. The game developer Cryptozoic Entertainment has picked up the project and is trying to fund it without using a crowdfunding site. It has promised to fulfill the Kickstarter game orders.